You have probably heard about the Instant Pot DUO pressure cookers. As Instant Pot claims, their DUO multi-cooker series is the #1-selling multi-cooker product on the market. That sounds pretty believable when you take into account the features of their DUO pressure cookers. If you have been wanting to get yourself an Instant Pot DUO multi-cooker lately, then you probably know that there are two models in the series: DUO plus 60 and DUO60. Given the considerable price gap between the two, you are probably wondering about the differences they have. Well, we are going to find that out! Let’s see a side-by-side comparison of the main features between the two models. Let’s first start with what similar features and characteristics the two products share. Possibly the most attractive feature in the DUO multi-cookers is their pressure cooking capability. Both DUO cookers support dual pressure cooking settings. The high pressure setting reduces cooking time by up to 70% (and hence the energy needed to cook), whereas the low pressure setting allows you to avoid overcooking delicate dishes. In addition, because of the reduced cooking time in the high-pressure mode, you should be able to preserve the juiciness in the dish better, which is one of the biggest advantages of pressure cookers in general. Thereby, when it comes to cooking performance, the DUO and DUO Plus pressure cookers are pretty much identical. While the DUO Plus cooker is slightly more functional than the regular DUO, both of the cookers are very versatile pieces of a kitchen appliances. After all, they both are able to replace several kitchen devices at once, which would allow you to save a lot of space, time, and also money since you could just get one device instead of 7 or 9. More specifically, the DUO60 model replaces 7 cooking appliances in one while the DUO Plus 60 replaces 9 appliances in one. A thing that the DUO multi-cookers are particularly praised for is their safety features. Both of the models are equipped with 10 safety mechanisms such as a safety lid lock, auto temperature control, electrical & thermal fuse, and others. 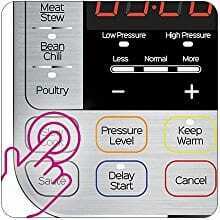 This is a feature that really makes both DUO cookers stand out from the competition. The 24-hour delay timer would probably be a very risky thing to use without those 10 safety features. Would you feel safe leaving the pot alone at home to cook while you are at your workplace? If you didn’t know, the delay timer feature allows you to plan the cooking ahead, which would be useful if you need to come back home from work and have a lunch immediately. This is an exceptionally helpful feature, and both cookers come with it. The Instant Pot DUO cookers come with a food-grade stainless steel cooking pot, steam rack, and lid. With both cookers, you can be sure that your food won’t be getting weird and unpleasant flavors during the cooking process. As for the exterior, the DUO cookers are made from brushed and fingerprint-resistant stainless steel. Besides, they both have right- and left-hand lid holders that could make them cookers much more convenient for left-handed users. The two products have pretty much identical design, and they certainly look nice. They may not be the sleekest or the most beautiful pressure cookers in the world, but they sure have a good design that won’t look ugly or out of place in your kitchen. Even though the DUO Plus is the more functional model between the two, it doesn’t differ from the normal DUO 60 model in its size. Both cookers measure 13.39 x 12.21 x 12.48 inches. Given that these cookers are designed to replace several kitchen devices at once, their compact size sure looks attractive. The DUO Plus is just a tad heavier than the DUO though, but the difference is negligible: would you feel the difference between 11.84 and 11.80 pounds in the 6-quart models? Probably not. The number one difference between the DUO and DUO Plus cookers is the number of cooking modes. The DUO model is a 7-in-1 cooker, while the Plus is a 9-in-1 cooker. The Cake program is suitable for making soft & moist cakes, Eggs program is used to prepare ideal eggs in just minutes, while Sterilize is used to sterilize baby bottles, jars, as well as pasteurize milk. The DUO Plus cooker allows the adjustment of cooking settings, pressure levels, and whatnot any time during the cooking cycle. If you need a bit more versatility during the cooking, then the DUO Plus will certainly be the better choice. In the earlier versions of the DUO series cookers, the differences between the control panels of the two cookers were truly huge. The DUO Plus had the much more intuitive control panel, while the DUO was often criticized for the weird placement of its buttons. The current DUO cookers don’t differ that much in this regard, but the DUO Plus is certainly the more convenient cooker. It has got the more readable blue LCD screen, as well as 4 status icons that indicate what the cooker is currently doing. However, keep in mind that both control panels may not be intuitive due to the abundance of settings and buttons on them. The user manual has also been changed. The manual is quite good in the DUO, but it is even better in the DUO Plus cooker. 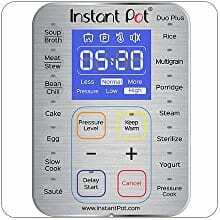 It is a bit briefer and easier to read since Instant Pot removed some things from it. Still, some people find both manuals not very easy-to-read, so this could be a matter of preference. All in all, the DUO Plus is the more versatile and the slightly more convenient model. Its 3 additional programs could really make a difference for some people, especially those who have kids and need to sterilize their baby bottles. If you don’t really need the Egg, Cake, and Sterilizer programs, then the regular DUO60 cooker would be more than enough. It still is an excellent pressure cooker, even though it doesn’t boast as many features as the Plus model. A thing to keep in mind before choosing one of the cookers though: if you have the majority of the devices these cookers are designed to replace, you probably shouldn’t get the DUO cookers since they will just take up more space and won’t do the thing they are designed for. Well, unless you are going to get rid of your rice cookers or steamers and get a device that could do everything at once.